OK, I admit it I love formulas. Formulas are instructive, as they force a laser-like focus as to cause and effect, or at least a parsimonious description of a complex system. They cut to the “have-to-haves” and omit the “nice-to-haves”. The work to achieve the derived resultant from each formula demands facts and not opinions and aspirations. Formulas also can provide a check and balance on faulty thinking. Checking what goes in the numerators and denominators of a simple ratio and how a denominator in another ratio can nullify the numerator of one ratio is a great check and balance and thinking tool. This article will provide my architecture via fairly simple formulas for synthesizing the seemingly competing demands of customer, people, and financial value. Others undoubtedly exist or you can derive your own. 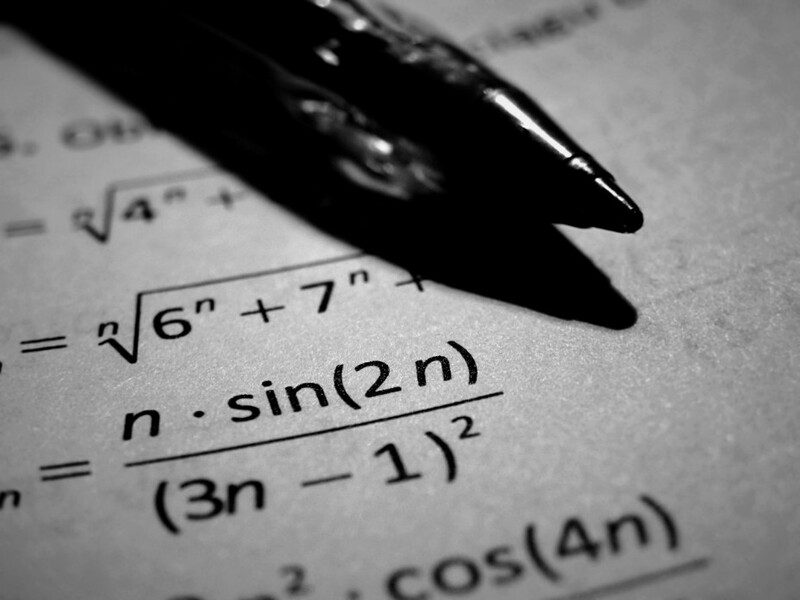 Formulas do have limitations – they could suggest that the work implied by the formulas is easy. As we all know though, the devil is in the details of the hard work that must be done. But business architecture through formulas can provide extreme clarity. The architect for your home or business office provides the blueprint from which your contractors work. No blueprint and you could end up with a faulty foundation, walls that don’t meet up, hot water in a toilet (actually happened to me) and other bad features of your home or office building. The same thing applies to business in my view. Unemployment is at a fifteen year low. 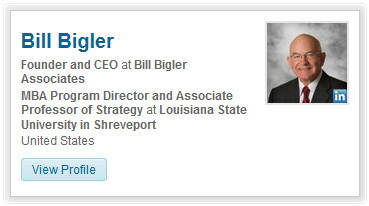 Headhunters can pick off your best people if they become dissatisfied. The stock market is at a fifteen year high in terms of seven of eight valuation measures. If valuation and stock prices fall from this high (a likely scenario), optimizing shareholder value for the publicly traded firm and Owner Wealth for the private for-profit firm will once again become very important. My research with some of my clients’ customers is beginning to show some customers are starting to feel like some firms are beginning to take them for granted. If this phenomenon is more widespread than my small sample research shows, customer value and customer satisfaction will once again become very important. The conclusion of this article is that all three of these aspects are equally important, even though I still think that increasing the value of the firm is the proper superordinate goal of the for-profit firm. But how these three aspects are synthesized is key here. I will make the position that Robust Business Strategy, properly defined, synthesizes these three aspects in dynamic alignment in the mid to long term. We will see the short-term can be a situation where customer, people, and financial value can be out of sync. I will offer some simple formulas for these now four aspects and try to show how they can get in dynamic alignment for increases in firm valuation. 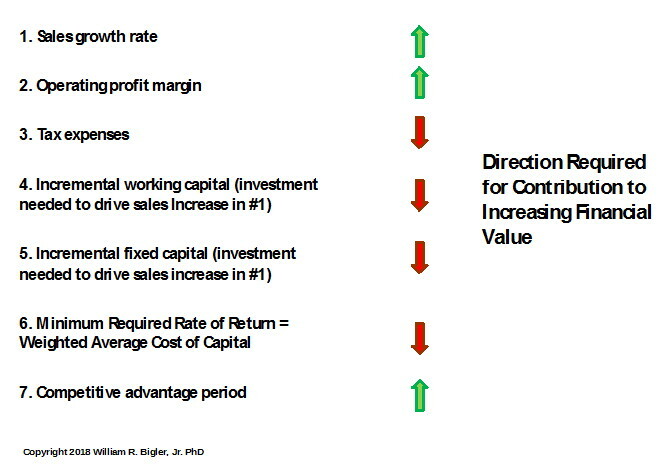 These numbers come from the pioneering work of Al Rappaport in his 1986 (revised 1998) book Creating Shareholder Value: The New Standard for Business Performance. It has become fashionable recently to criticize shareholder value. I think these criticisms refer to the activist hedge fund and certain private equity firms that are fairly ruthless in working only the financial numbers. I agree with these assessments. For me and for work by McKinsey and Company in Valuation: Measuring and Managing the Value of Companies, Koller, and et.al. 2015, shareholder value optimizes aspects for the long-term health of the enterprise. The numbers are pretty straightforward except for maybe Competitive Advantage Period (CAP). But the first five numbers produce Free Cash Flow and the sixth number is the required return for debt and equity investors. Firms who enjoy Free Cash Flow Return on Investment greater than the Weighted Average Cost of Capital are “wealth creators”. CAP is the length of time into the future that the other Drivers are expected to remain favorable. A CAP of two years is better than a CAP of six months. I am discussing Financial Value first but we all know it is the end result or “lagged” measure of other “lead” measures producing the Financial Value, primarily Customer and People Value. By the way, this is very Balanced Scorecard like for those familiar with this framework and tool. But it is different and the real inspiration comes from my two and a half years at the Thomas Group, then a leading Operations Excellence consulting firm. Customers receive Value when the Benefits they receive from the products and services we provide for them are greater than the Burden they must bear to get those Benefits. Burden is the Price customers pay us, but it is also any “hassles” that in essence causes the customer to pay for things we do not provide for them and get them hacked off in the process. Lack of a service department, lack of warranties and spare parts, run-arounds, surly attendants and the like increase Burden. In today’s world, if Burden gets greater than Benefits, customers walk to a competitor, many times without giving us a second chance. As the formula depicts, we want Benefits to be as high as possible while Burden being as low as possible. 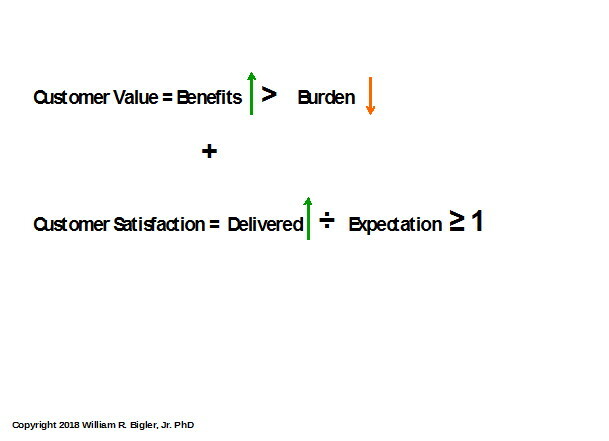 Customer Satisfaction is related to Customer Value but it is different. Customers are satisfied when what we Delivered for them is greater than or equal to what they Expected we would Deliver for them. Customers can be satisfied in the short term but come to realize what they have bought from us has little Value. While not common these days, think of the brand new car that turns out to be a lemon. These customers can switch to another car company for their next auto purchase with a vengeance being perceived as being duped. The formula depicts we want what is Delivered to be as high as possible. Expectation is a tricky one as it is the denominator of a ratio. Mathematically we would want to lower Expectation to maximize the ratio. But this is non-sensical and here our thinking is we do not want to inflate Expectations. This almost always leads to declining Customer Satisfaction. Ok, our math review is getting a little more complicated! The value of People to their firms is their Productivity. But productivity is enhanced by optimizing the two ratios above. The first ratio is the degree of actual Goal Achievement by each person divided by the Effort to achieve those goals. 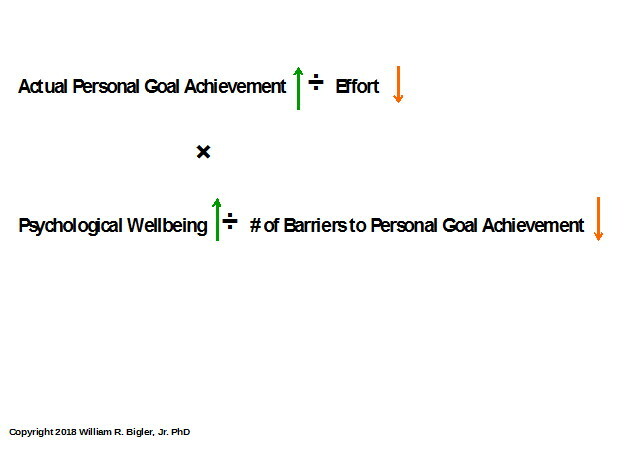 Mathematically, we want the highest Goal Achievement at the least amount of Effort. Lest you think I am suggesting People become lazy, I am not. Effort here means that each employee can apply productive work hours with as few barriers getting in their way as possible. There is nothing more frustrating for the People of your firm to feel they have to fight barriers every day to accomplish their goals, which if aligned with the organization’s goals makes for synergistic power driving Productivity and overall firm performance. Part 2 of this article will introduce the notion of Robust Business Strategy that I will offer as the means to synthesize Customer, People, and Financial Value to grow the market value of the firm.